LEFT: Digital mockup presented to client for design approval. 3D modeled and rendered in Strata 3D. RIGHT: Photo of the installed display. Display for Rome Air Force Base in Utica, NY ties into an existing timeline that runs the length of the opposite wall. I was tasked with designing a continuation of the timeline that would match the look and materials of the existing display, which hadn’t been updated in 10 years. The components are a combination of wall-applied vinyl prints and black-core Dibond and Sintra panels affixed to the wall with hi-strength adhesive — because penetrating the wall in any way, with screws, nails, etc. was prohibited. 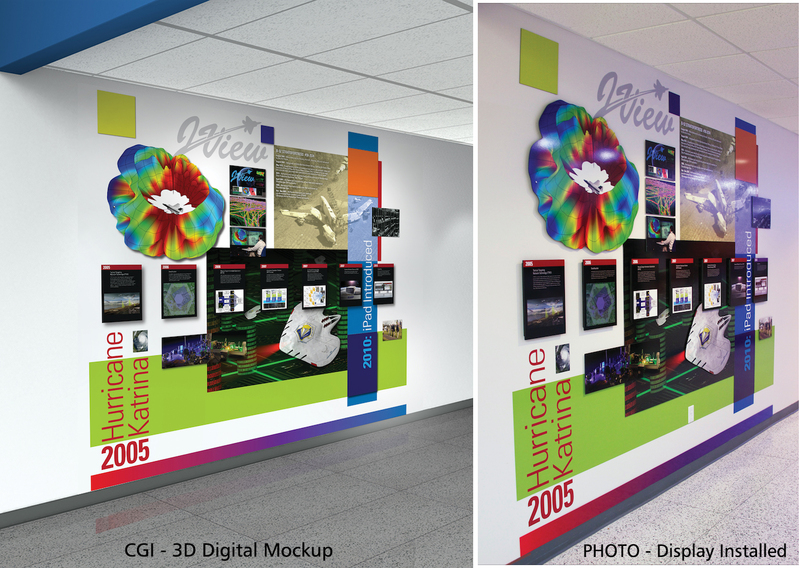 In the image above, the left side is a 3D modeled mock-up I did once I had all the graphics together and the design schematics worked out, so the client could see what it would look like installed. On the right is a photo of the display after it was installed. I did the design, graphics & layout schematics, and worked with the printers to select materials and methods to match the existing timeline installation. I also was on site to oversee the installation.